CELLS alive! represents 30 years of capturing film and computer-enhanced images of living cells and organisms for education and medical research. The site has been available continuously and updated annually since May of 1994 and now hosts over 4 million visitors a year. 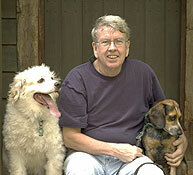 All text, images, and layout are provided by me, Jim Sullivan (resumé) shown here with Boo and Bella. Every effort has been made to minimize errors or typos, but any you find on these pages are my doing as well. The majority of the site is free of cost and registration for anyone with internet access. With up to 45,000 visitors a day during the school year, hosting costs are an issue. Students and teachers who purchase downloads for classroom use make this possible. A stock video library for producers includes a range of subjects, both live recording and computer animation. Individual still images and interactive animations found on this site may also be licensed for some educational and limited commercial uses. To determine if your use is acceptable and to obtain a quote, contact me with the specifics. Sullivan, James A. CELLS alive! (https://www.cellsalive.com) Published and updated continuously since May, 1994.